AS the global media and human rights communities mark the event of World Press Freedom Day, ARTICLE 19 calls attention to the ongoing need to ensure that freedom of expression is safeguarded and enhanced in all parts of the world. 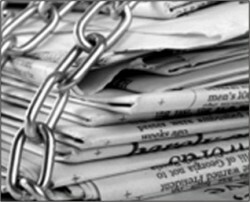 The theme for UNESCO World Press Freedom Day 2009 is "Fostering Dialogue". In line with this topic, ARTICLE 19 continues to fulfil its core mandate by working closely with partners from the media and civil society to promote the right to freedom of expression in various parts of the world. Camden Principles: ARTICLE 19 launched the Camden Principles on Freedom of Expression and Equality, a ground-breaking document that will guide legislators, policy-makers and civil society in balancing the mutually enforcing rights to freedom of expression and equality. A key principle of the document is to "promote dialogue among different communities" and addresses a number of global requirements for media diversity. Africa: In April, ARTICLE 19 East Africa co-ordinated a gathering of media professionals, human rights defenders, academic and community representatives in Kenya which developed the Machakos Declaration on Freedom of Expression. This document affirms the fundamental principles of free expression enshrined in international human rights frameworks and recognises that freedom of expression is crucial for democratic reform, good governance and poverty reduction. This comes at an important time for Kenya, where an uneasy coalition government is in office after the post-election violence in 2007. The Machakos meeting recognised that not all elements of the media had reported the elections and subsequent violence objectively; indeed some segments had worsened the situation through biased and unprofessional reporting. It is critical for the democratic future of Kenya that the media is given the freedom to report independently on societal events, and that it also acts responsibly to provide balanced and fair reporting. There is an ongoing constitutional review process and ARTICLE 19 is actively working with partners to ensure reform of existing freedom of information legislation and broadcasting legislation, in order to provide a more enabling framework for the media. Asia: ARTICLE 19 Bangladesh recently launced a new handbook on the Right to Information, in question-and-answer format, for the media and legal sectors in Bangladesh on World Press Freedom Day. This forms part of the organisation's continued work in this country to promote freedom of information and strengthen the ability of the media to report on issues of importance. At the event on Sunday 3 May, ARTICLE 19 also presented awards to a group of women journalists, drawn from grassroots and community media structures, who have recently undergone a fellowship programme through ARTICLE 19. This programme is helping to promote diversity in the media and empower locally-based journalists to better report stories within their own communities and in the national press. Latin America: Throughout 2009 ARTICLE 19 Mexico is running a campaign to protect journalists titled "What you don't know can hurt you". Part of the campaign will this year include an international seminar bringing together different stakeholders to discuss how best to document and raise alerts on abuses against journalists and to publish a "Protocol to Monitor, Document and Follow up on Aggressions against Journalists" for Mexico. A website together with television and radio spots are also being launched to widen understanding of the situation and identify the best way to support a free press. Source: ARTICLE 19, a human rights pioneer, defends and promotes freedom of expression and freedom of information all over the world.